A few weeks back I was invited to participate in the “Meet the Bloggers” session at the Adoption Ethics and Accountability conference, but will be unable to attend. One of the most disappointing things about not going is that I won’t be able to finally meet some pretty incredible people like Linh Song, Indigo Willing and our very own Jae Ran from Harlow’s Monkey. During the Reception on Monday evening, October 15th, you will have the opportunity to “Meet the Bloggers”. For those unfamiliar with blogs, they are a form of internet social networking, i.e., digital communities. Some blogs provide commentary or news on different subjects such as food, politics, or local news; others function more as personal online diaries. Blogs are interactive; readers are able to leave comments, which then generates online discussion. The bloggers participating in this session will also cover the conference on their blogs, sharing observations and interviews with the online community. Be sure to check out their sites before, during, and after the conference. In this casual session we have an exciting opportunity for conference attendees to meet bloggers who are making waves in the adoption community. The blogosphere has become the new platform for adoption activists and a way to inform the community, allowing triad members and professionals to organize and build upon the adoption experience. Join us as we meetthe people behind the blogs and learn how they’ve revitalized the community. Bloggers from all perspectives – adoptees, first parents, adoptive parents, and activists – have been invited. The following bloggers have confirmed – check back to see the list grow. David’s website paved the way for bloggers seeking information on how to assess adoption agencies and avoid adoption fraud. His personal experience, subsequent community organizing, and continued advocacy for transparency brings thousands of visitors to his website. The Smolin family’s blog details adoption fraud, corruption, and other unethical practices and has proven to be a vital resource for prospective adoptive families. A critical voice, the blog advocates that there is no room for injustice in international adoption. Jennifer is an adoptive mother with a painful experience of attempting to adopt a child from China . Her story has motivated her to inform the community of the intricacies and possible pitfalls in international adoption. Elizabeth ’s site pre-dated blogs but inspired other families to share their experiences with adoption fraud as well as help families navigate the structure of international adoption. Margie is the adoptive mother of two Korean teens and co-founder of Korean Focus. She thinks out loud on her blog about intercountry adoptive parenting, adoptive parent responsibilities toward their children and the adoption community, and truth in adoption. Claudia is a domestic first mother who has lent her writing and community organization talents to her blog as well as Origins USA. She has rallied the triad against injustices against vulnerable parents as well as covered issues on open records and informed consent. The first time I watched Daughter from Danang by filmmakers Dolgin and Franco, I was so happy to finally see a film being made about a Vietnamese adoptee. To my relief as well as great sadness, Heidi’s story was proof that there were others out there whose lives had followed a similar path to mine. I could identify with her growing up in the south within an all-white family and trying to blend. Memories began to surface of my own attempts to cover and pass hoping others would forget and allow me to forget my origins. At the time of my first viewing, I was in a different place and more naive about adoption, the war and my own story. The beginning of the film came as a shock as it brought into question things I’d heard about Operation Babylift. I remember feeling disgusted as I watched a social worker solicit Vietnamese parents for their children saying that it would be “better for everyone”. “I am not taking them away from you. I’ll send them to good families,” coaxes an American volunteer social worker. Did the parents she might have repeated this to understand what a contradictory, presumptuous statement she was making? How many of them thought they would have their children returned to them once “the danger” had passed? How many held onto hopes that they’d be able to join their children in the US? The stories of the families left behind seem largely untold. The glimpses we have been offered so far seem to be mostly from within the general context of the war. As far as I know, there has never been a comprehensive report or study done that concentrated on the family unit itself and the individuals within. As the film progressed, focus became increasingly concentrated on Heidi’s negative reactions to the unexpected “culture clash” she experienced. Naturally, it became increasingly difficult to keep my own bias from affecting my interpretation of the film. To my surprise, I began to have negative feelings towards Heidi despite knowing I was in no place to pass judgment. In one scene, she was sitting on a bench in front of the camera complaining about constantly being touched. I didn’t know what to make of it. To me, it made sense but to Heidi, it was overwhelming and suffocating. By the time Heidi’s distress reached it peak over her half-brother’s request for financial assistance for their mother, I felt something close to disgust at Heidi’s behavior. I still don’t know why I felt this way. In her place, I might have had similar reactions, but what exactly was Heidi’s “place” at the time the film was being made?” We are given the expected biographical information on Heidi; country of origin, Vietnam War, Operation Babylift, childhood and adulthood, events leading up to her reunion. We are even allowed a few insights into her mind by way of a few blurbs on her thoughts as a Vietnamese adoptee. What it doesn’t emphasize is how terribly isolated Heidi really was before and during the making of the film. It wasn’t until I read the Choys’ piece in Outsider’s Within that I began thinking about it again. In talking to other adoptees, I discovered that my initial responses weren’t all that unusual. The general consensus seemed to be that there was definitely something wrong with the film though opinions varied as to the specifics. The second time around, it was pretty much the same as I’d remembered except that this time, I considered things that hadn’t occurred to me before. I still thought it started off well, though like the Choys, I again noted a shift in the film’s tone and focus. What began as a critical look at Operation Babylift quickly deteriorated into a bombardment of emotions resulting from an East/West “culture clash.” One becomes in danger of being swept away right along with any previous attempts at critical thought. By the end of the film, some part of me also wishes Heidi had not gone back to Vietnam at least not under the circumstances in which she’d gone. She was without having prior contact with other adoptees and the benefit hearing their experiences might have offered. She ran headlong into her reunion with her Vietnamese family with little more than her own expectations. I say this not as a criticism of Heidi, but to emphasize that what we’re seeing in the documentary cannot be simplified down to a result of “culture shock.” While that is a reality for many of us as transethnic adoptees, it is still only a small part of a much larger picture. Though the film does take the time to clue us in on Heidi’s search for unconditional love, it soon gets lost in the east vs. west framing. Romanticizing our reunion with our original families is something I think we all do no matter how much we attempt to equip ourselves. The resulting disillusionment on top of an already stressful situation can be devastating. I can agree that it is nearly impossible to fully prepare oneself or someone else for many of the things we encounter as adoptees. Uncertainty and the unexpected are things with which many of us become very familiar at a young age, but it seems Heidi had not been equipped with even the most basic of tools. The film is falsely considered an “adoptee narrative” which can make the viewer forget that Heidi is treated as more the subject of the film than the speaker. The filmmakers keep themselves behind the camera to re-enforce the illusion. We hear the words coming from Heidi’s mouth, see her moving from place to place yet what we hear and see is still in control of the editors of the film. Again, I agree there is no way to fully prepare anyone, but Heidi’s apparent obliviousness makes me wonder if any real attempts had been made at all. If there were, the documentary fails to show us more than snippets of a language lesson given literally on the fly. For many of us, it would seem common sense that her family might request financial assistance, but Heidi seemed so fixated on her “dream” that it caught her completely off guard. As for whether it was her job to help prepare Heidi, who knows? I think it should be kept in mind however that Heidi was without a support system of any kind which left her reliant upon her translator for both practical as well as moral support. Imagine yourself alone in an almost completely alien environment with your only link to the familiar being your traveling companions. Who would you pick as your new best friends? That gives an incredible amount of influence and maybe even responsibility to both the filmmakers and Mrs. Nhu. She was losing the closest thing she had for support and understanding and her link between her two selves. Who wouldn’t want to leave such a strange situation and return to the only support system one had? Is it possible that Heidi somehow felt abandoned by the one person on which she’d come to rely? 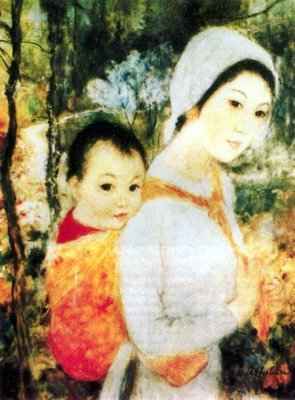 She was clearly under stress and feeling the need to escape, yet Mrs. Nhu encouraged her to stay. In the following scenes we see Heidi break down before she finally implodes. The filmmakers want to appear as the non-interfering observers of it all, yet we are reminded of their presence when at the height of Heidi’s distress she says, “Take me away from here.” Who is she addressing and can they not see that Heidi is calling out for help? At this point, her lack of control over the situation becomes even more pronounced. I couldn’t help but feel that Heidi had somehow been set up. If not intentionally, then certainly out of ignorance. In their contribution to Outsider’s Within, the Choy’s point out that Dolgin and Franco had “virtually no familiarity with international or transracial adoption” yet Daughter From Danang is often referred to as being a “sensitive” portrayal. Being truly sensitive to another’s situation and conveying that to an audience requires at least some knowledge of that situation and sympathy beyond one’s own motives. At times, I’m tempted to conclude that initially, Mrs. Nhu and the filmmakers were so intent upon documenting a happy ending that everything else gets shoved into the background. All that being said I do take into account the times in which Daughter from Danang was produced. Much less was known or even considered regarding the Vietnamese adoptee perspective and many of us were barely beginning to speak out about our experiences. Just two years prior to the release of the film, the emergence of the Vietnamese adoptee community was marked by the establishment of The Vietnamese Adoptee Network in the US and the launching of Adopted Vietnamese International in Australia. Since then, many of us have “come into our own” and have begun to tell our own stories. It seems only natural that the documentation of our histories as adoptees should follow suit and make room for our independent voices. We have already been bombarded by the voices of others as they build their reputations and sometimes their incomes based upon our stories. In the meantime, are we supposed to sit back and smile feeling grateful that we were mentioned at all? Once in a while, we are even allowed to speak yet even then, only if what we have to say fits within a framework created by someone who’s not an adoptee. I think it’s time we step away from documentaries like Precious Cargo and Daughter from Danang as they are outdated and treat us more as subjects and/or victims rather than narrators. As the work of Vietnamese adoptees like Indigo Willing and Dominique Golding illustrate, we are capable of speaking for ourselves as thinking adults. For those who would claim to support the Vietnamese adoptee community, what better way to show that than to support our right to speak as individuals rather than as decoration for someone else’s scrapbook? This is a lengthy one so I’m only posting the first few paragraphs. What I find interesting about the article is that it gives us a glance into the inner workings of adoption as an industry. While many see adoption as mainly a means to help the poor, it can easily become a means for exploiting them. Second only to China for Americans seeking children, Guatemala is tightening its rules. Guatemala City – American parents cradle their new babies in cotton blankets and feed them bottles of formula. They clog the lobby of the Marriott Hotel in Guatemala City with strollers. Penny Conner, from Medfield, Mass., says she cannot wait to bring her 9-month-old boy home. It’s a joyous scene: Guatemala is one of the most popular places to adopt for American families – second only to China. But across town, Angelica Lopez cries and can’t stop. A year ago, three women kidnapped her 2-month-old baby daughter, she says. Her story is the underbelly of the country’s multimillion-dollar adoption industry. When it comes to red tape, Guatemala is one of the easiest places to adopt a child in the world. And depending on who you ask, the adoption program is either a godsend for thousands of needy children, or a nefarious business that has given rise to kidnappings, coercion, and mothers reproducing for compensation. In either case, 95 percent of the babies end up in the US. Now Guatemala is moving to more strictly regulate the adoption process, under internal and international pressure. Due to lack of government oversight and emerging problems, the US government announced earlier this year that it no longer recommends that US parents adopt from Guatemala. As a result, Guatemala is set to implement the Hague Convention on Intercountry Adoption Dec. 31, which sets international standards for adoptions and could greatly limit the program. Critics, including adoption agencies and Guatemalan lawyers, say that tighter regulations will leave thousands of babies without safe homes in this Central American nation, in which 80 percent of residents live in poverty and the infant-mortality rate is one of the highest in the hemisphere. But many others say that more restrictions on the process is crucial to the children’s well-being. Around the same time last year, Ji in at Twice the Rice wrote an incredible post entitled “As good as the real thing” in which she mentions the image below. In her post, Ji in takes a critical look at the image while placing it into the wider context of adoption attitudes and language. She touches on the idea of paper pregnancies and what it suggests about underlying attitudes APs may have towards adoption and the birth countries of adoptees. Yes, my jaw fell open as well. In the case of TRAs/TNAs, what may be intended to signify appreciation for a child’s race and birth culture may unintentionally demean or misappropriate them them instead. The red thread quote that’s so popular among APs of Chinese adoptees is good example of cultural misappropriation. In a post featured at Racialicious, iBastard with his usual flare drives home this point as he illustrates how the impact of some of these shirts can undermine their original intent. Many of us have spoken out against the ever growing popularity of adoption related fashion trends and their objectification of adoptees and their birth countries. It’s been a year since Ji In’s post, but it seems we still have a long way to go. Recently, this was brought to my attention. 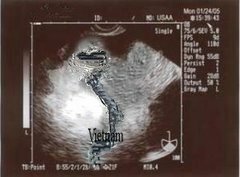 Am I crazy or is this the same exact ultrasound photo except that China has now been replaced with a badly ‘shopped image of Vietnam? As a photoshopper, the sloppy editing and lack of originality only adds insult to injury. If you’re going to do something like this, at least have some pride in your work instead of throwing together some cheap looking imitation. The connotations that could be gathered from a comparison of the two alone would fill up pages. 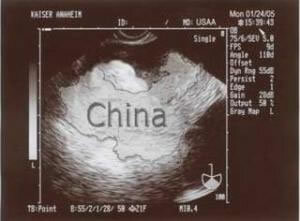 It’s bad enough that this image, like the China one, reduces an entire country to a source from which to acquire babies. The children that are adopted from Vietnam came from Vietnamese mothers who are human beings not cows on a breeding farm existing only to satisfy PAPs demand for babies. It’s especially disturbing to see this kind of mimicry among American APs of Vietnamese adoptees. The China version just shocked and pissed me off, but seeing a Vietnam copy fills me with something close to rage. Vietnam is not like China and the two are not interchangeable. As Vietnamese adoptees, our histories have their own unique set of circumstances. We come from a country that is still feeling the affects of a war that happened over three decades ago. The image doesn’t take into account that many of us ended up as adoptees because war tore our birth country apart, a war involving American soldiers. When I look at that image and think back to the thousands of Amerasian children abandoned by their American fathers, I want to scream. Something about the image begins to feel like a slap in the face, even more so when I consider the Vietnamese mothers who lost their children because of war, poverty, social pressure and/or corruption. It isn’t that I’m unsympathetic towards APs who want to celebrate a referral. I can understand the anticipation and joy, but surely it can be done without disregarding the loss others had to suffer in order for them to have that moment. If APs cannot be sensitive to this, then how can we expect them to provide the support and understanding for their adopted children who may be struggling to make sense of it all?